Tickets are now on sale for the Lake Country Chamber of Commerce Christmas Party! You won’t want to miss this exciting event at Turtle Bay Pub on Thursday, December 13, 2018 @ 7 pm. Tickets include 2 glasses of wine and amazing appetizers throughout the evening. There will be tons of door prizes, a 50/50 draw as well as a raffle on a Wagon of Wine! Bring your Lake Country bottle of wine for the wagon and receive 3 tickets on the draw. To add to the excitement of the evening we will also be announcing the TOP 3 FINALISTS in each category for the 2018 Business Excellence Awards. The winners in each category will be announced at the BEA Gala on February 22, 2019 at the Four Points by Sheraton. 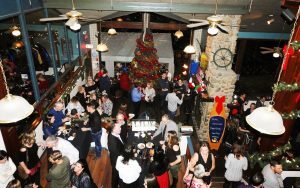 Our Christmas Party SOLD OUT quickly last year with over 200 guests! Get your tickets now….